The Hon’ble Chief Minister of Rajasthan, Vasundhara Raje has taken a very important decision which is going to change the face of per party forever. 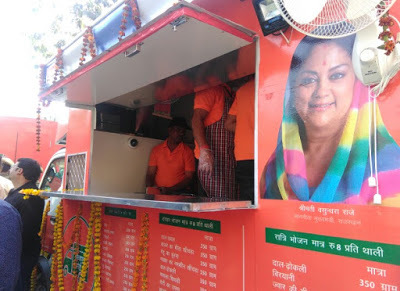 She is going to introduce affordable canteens throughout the state, which will be known as Annapurna Rasoi. These canteens will be hygienic and will offer food at minimal and subsidized rates to the needy people of the state. Raje is walking on the same path that Late Jayalalitha following to win the hearts of millions of Tamil Nadu people. Jayalalitha, also known as Amma was a Godly figure for many Tamils due to her several pro-poor schemes, including Amma canteens which offer very hygienic and affordable food to poor and needy. Under the new scheme food will be available for the needy beneficiaries across the state of Rajasthan at very affordable rates. The Annapurna Rasoi canteens will provide breakfasts, lunch and dinners under this social scheme to the needy people. Not only that, proper hygiene and nutrition will be maintained in these canteens so that there will no compromise in health of those eating. As per the announcement made by CM, the breakfast will be available at the rate of Rs. 5. The rate of lunch as well as dinner is fixed at Rs. 8. Similar rates are there in the Amma canteens available across Tamil Nadu. Food materials will be provided to these canteens for every meal through corporation vans. 5 Food rates Breakfast- Rs. 5. The CM has clearly mentioned that the needy and poor people will get very affordable and highly nutritious food from these new canteens which will be rolled out across the state very soon. As per the announcement, all those people who belong to weaker sections, below poverty line, daily labourers, factory workers, farmers, rickshawallas, auto and taxi drivers, students, women, senior citizens, disabled people, etc. will get hygienic ads well as nutritious food from these canteens under the ARY scheme by the government. The Rajasthan govt. has also selected the spots of opening these canteens in these places. There will be dress code for the workers and cooks of the Annapurna canteens. As the Raje Govt. is gearing up for the assembly elections to be held in 2018 in the state, this scheme of opening affordable canteens for poor is considered as a great step for winning more votes. For breakfast, these public kitchens will serve items like poha, idli sambhar, sevaiya, lapasi, millet kichada, jwar kichada, and wheat kichada. The cost of breakfast will be Rs. 5. Lunch and dinner plate will cost Rs. 8. For lunch, Annapurna kitchens will serve items like entil rice, wheat churma, roti likeness, mecca salty khichada, dal-dhokali, kadhi-vrookli, rice brine, salted brine of jowar or sweet khicha of wheat. For dinner, people will get biryani, dal-urokali, sweet khichadi of jowar, kadhi-rice, snacks of rice, besan gatta casserole, salted skewed of corn, sweet lentil of millet, pulse-rice or wheat churma. The state government had launched the Annapurna Kitchen Yojana to offer poor and labors with quality meals, at affordable rates. The central government wants to open these public kitchens in all parts of the central. To ensure high quality meals, Jabbar Singh Chauhan has recently inspected six Annapurna Kitchens in Rajasthan. After inspecting the food and cleanliness aspects, he instructed the cooks to improve the chapatti quality. He also checked the water that the cooks use to cook and clean utensils. It was done to make sure that people were getting high quality food that was not contaminated in any way. He also suggested other minor changes, which will help the kitchen organizers to improve their service.